2019 Grant Application Window is Now Open! Over the past 10 years, your support has touched the lives of so many senior dogs and the people who love them. Grey Muzzle grants, powered by you, ensure senior dogs get the care and love they are often lacking. 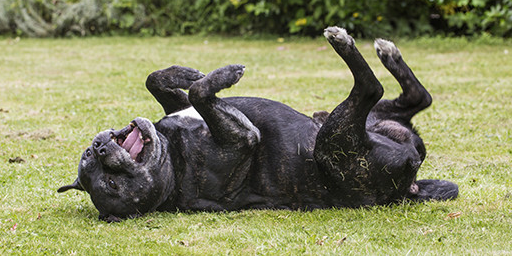 A decade of saving senior dogs means thousands of grey muzzles have had more belly rubs, more kisses and more to celebrate. On behalf of every old dog you’ve helped over the past 10 years, thank you for your compassion and generosity. Will you help make the next 10,000 kisses possible? Please give now and help us take a step closer to that beautiful day when every senior dog is cherished and no old dog dies alone and afraid. 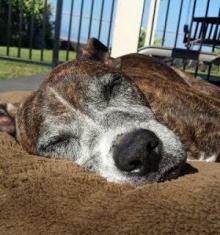 Do you love old dogs? If a senior dog has ever touched your heart and shared your home, this calendar is for you. Grey Muzzle’s 2018 calendar celebrates the bond we share with our old dogs. And better yet, all of the proceeds from the calendar will be used to help homeless senior dogs. The only thing better than seeing a new frosted face each month is knowing that you are helping senior dogs who need a second chance at a happy ending. 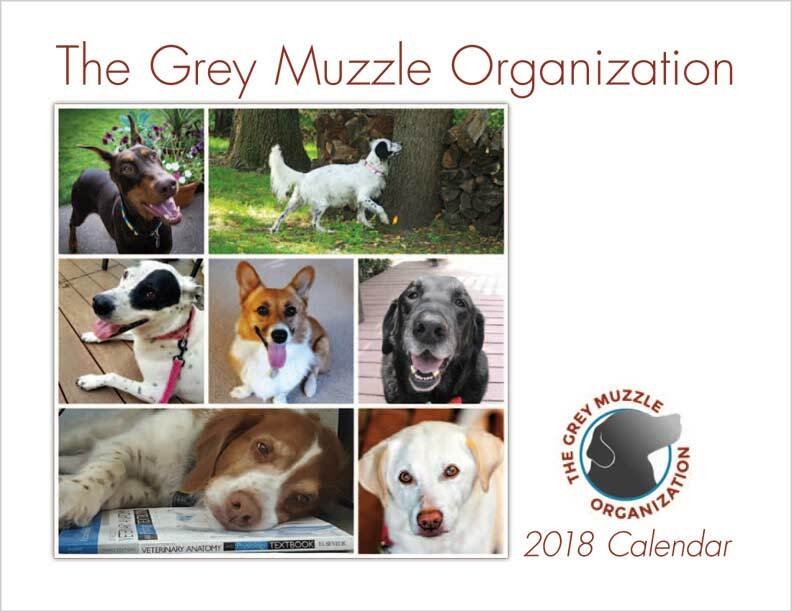 Order your 2018 Grey Muzzle calendar today! Grey Muzzle funding supports senior dog programs nationwide. Senior dogs depend on us to care for them through all stages of their lives. Your tax deductible donation will provide them with the care they need to get adopted and live out their golden years, months, or weeks in a place of love, security and peace. Donate Now We regret that this link leads to an inaccessible third party page. Please contact us for assistance. Grey Muzzle is a non-profit charitable organization and a GuideStar Exchange Gold Participant, the only pre-grant due diligence tool that is 100% compliant with IRS Rev. Our supporters celebrate the pets they have cherished by making a special Grey Muzzle Memorial donation. In the past 6 years, with your help, we have donated over $40,000 worth of orthopedic beds to more than 100 shelters around the country to help dogs like Booty get off the concrete floors. Join us to help old dogs! You'll get the latest old dog news just every few weeks. Our monthly e-communications include stories of the dogs and people who have been helped by our support, tips for senior dog care, and updates on the latest happenings at Grey Muzzle. I am helping save homeless senior dogs.